Villa Waterfall is found on the southern tip of the island of Koh Samui, situated somewhere within its hills surrounded by natural elements and a forest-like ambiance. With lush greenery immersing the villa in a tranquil bubble, you can rest easy in your private haven and enjoy a calming holiday with loved ones. The unique feature of the villa is an indoor-pool with a waterfall and an electronically-controlled water flow. 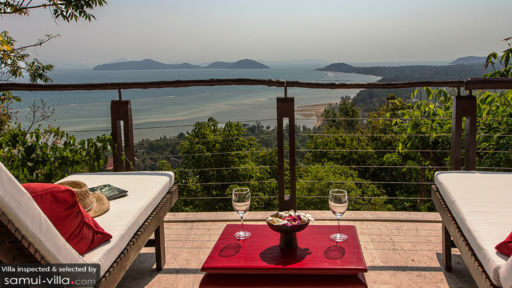 The two-bedroom retreat is designed in a traditional Thai structure with wooden interiors, vibrant décor, stone sculptures, and an infusion of the outdoors with the indoors. The two bedrooms at Villa Waterfall are both furnished with four-poster, double beds with white drapes around them for a comfortable and restful night’s sleep. The bedrooms head out to a terrace from where guests can appreciate the island-view. The bedrooms each have an en-suite bathroom with necessary facilities and amenities. The lower bedroom has air-conditioned, while the other bedroom has ceiling fans and natural airflow. Both bedrooms also have a writing desk, if you wish to get some work done amidst the peace and serenity of Samui. Around the villa, you will find Thai artwork on the walls for a traditional touch to the villa’s interiors. The villa allows direct access to the beach, so you can enjoy a fun day out on its sandy shores, playing in the water, building sandcastles or simply sunbathing. The terrace of the villa is furnished with deck chairs that overlook the panoramic view of the island. On the lower-level you will find a nice setup where you can enjoy your morning or evening tea against the glowing backdrop. For a truly relaxing and refreshing holiday, Villa Waterfall is the perfect destination as it brings in the natural elements that it is surrounded by as you can enjoy a tranquil swim indoors, with a waterfall meditatively in the background. The open-concept living area at Villa Waterfall is a funky space with a Bohemian vibe owing to a high-soaring wooden ceiling, freeform couches with colorful cushions, exotic wall-hangings, indoor plants and boulders, rock wall towards the back, and chandeliers. There are other comfortable sitting options including chairs, window seats, and others. As you rest indoors, the outdoors is at your doorstep so you can get the best of both worlds. The dining area is in the living room with a four-seater dining table situated right beside the opening so you can eat while enjoying the spectacular view. The kitchen is a well-equipped and fully-functional affair with several amenities and appliances for your ease and convenience. 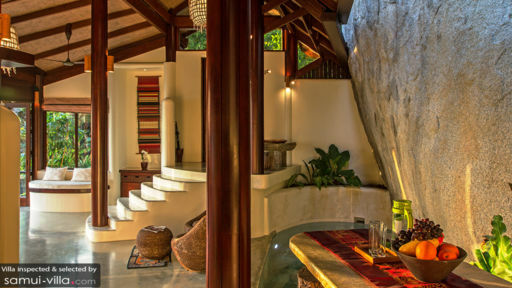 Villa Waterfall offers world-class amenities to its guests and a staff to look after all their needs and requirements. There is a weekly maid, housekeeping and a villa manager to take care of things. 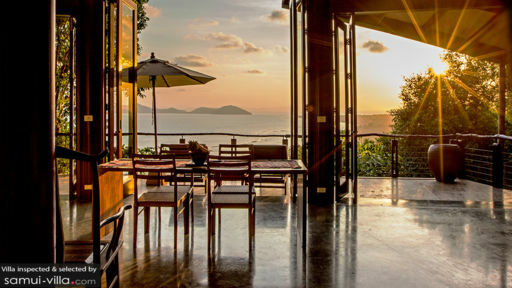 The owner has even prepared a welcome pack with recommendations and things to do around Samui! The villa is located in its own private space surrounded by abundant greenery, trees, and the sea in the distance. You can head to Chaweng and Lamai beach for some additional fun exploring the restaurants, bars, and such. There is a lot of land to cover, so you can bike, rent scooters or simply walk to places to discover hidden gems, interact with locals, and learn more about Samui’s many beaches!